(Newser) – There will be no thumbs-down moment coming: Sen. John McCain on Thursday announced that he's in the "yes" camp on the GOP tax bill, a decision he says he came to "after careful thought and consideration." In a statement, McCain described the legislation as "far from perfect" but still able to "enhance American competitiveness, boost the economy, and provide long overdue tax relief for middle class families." CNBC sees the move as "increasing the plan's chances of clearing the Senate by Friday"; Vox writes "it will probably pass." Fifty of the Senate's 52 Republicans must vote yes in order for that to happen. 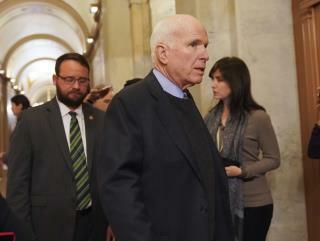 Looks like McCain finally pulled his thumb out of his a-s-s.
What a shame. And here I thought he was one of the few on the Hill that would vote the people first. Guess I was wrong. I know it's cruel but, if this train wreck of a tax plan passes, I hope he lives long enough to feel the guilt of having helped it happen.